Playable with Playstation®3. Replace your computer's keyboard and mouse when gaming. If such is the case, we will try all we can to replace the item with an identical item in working condition. See pictures for details. For Guitar Dongle. May have minor scratches. Category: PlayStation 3. Platform: Sony PlayStation 3. Model: PlayStation 3 - Original. Connectivity: Wireless. Wireless Technology: Bluetooth. Location: #G110 pull 2. Original accessories may or may not be included. Pink Sony DualShock 3 PS3 Gamepad. Condition is great. No marks or damage. Shipped with USPS First Class Package. OEM - Official - Genuine. Tested - Works Great. Motion sensing technology. Each hit, crash and explosion is more realistic when the user feels the rumble right in the palm of their hand. Helpful Links. Each hit, crash and explosion is more realistic when the user feels the rumble right in the palm of their hand! (see pics) - sold as is. Converts the two USB ports into five USB ports. Easy installation. Media / Blu-Ray Disc Remote Control for Sony PlayStation 3 PS3 System. Never been used, just moved around my garage a bit. Packaging shows light wear, but this has only been taken out of the box to remove the batteries so they didn’t corrode. All yours “like new” for an open box price. Shipped USPS First Class. Motion sensing technology. Product Features. Condition: Used in good condition, Tested 100% Original SONY REMOTE. 4 out of 5 stars - Official OEM Sony PlayStation 3 Six-Axis Controller (Please Read) - Works! 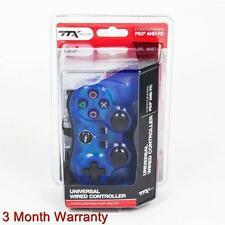 86 product ratings86 product ratings - Official OEM Sony PlayStation 3 Six-Axis Controller (Please Read) - Works! PlayStation 3. 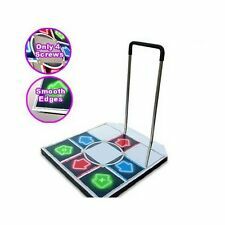 We are the only Authorized Distributor of this product! Power A Wireless Controller PS3 Power A Black Play Station 3. Shipped with USPS First Class Package. Qanba joystick & 8 Qanba buttons. Playstation 3, PC compatible out of the box. Square gate included. Also includes circle and hex gate. Trending at $25.85eBay determines this price through a machine learned model of the product's sale prices within the last 90 days. Fast action trigger buttons. Usually we declare the lower value. Excellent working condition. Includes one (1) charging cord. This will avoid us opening an unpaid item case. We are more than happy to help you try to resolve any issues you have. PROBLEMS WITH YOUR ITEM. Tested! Great Conditions! OEM! Fast Ship! Free Ship! Tight Joysticks! 4 out of 5 stars - Genuine OEM Sony Playstation PS3 Wireless Controller Dualshock Sixaxis CECHZC2U! 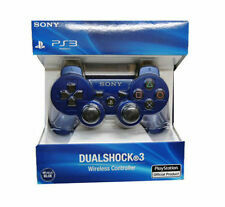 86 product ratings86 product ratings - Genuine OEM Sony Playstation PS3 Wireless Controller Dualshock Sixaxis CECHZC2U! Looking to raise your level of gaming skill?. Condition is New. Easy to Attach & Use Design with Short Learning Curve. Signature Afterglow blue lighting. Compatible with Windows 7 and up. Highly sensitive SIXAXIS motion sensing technology. 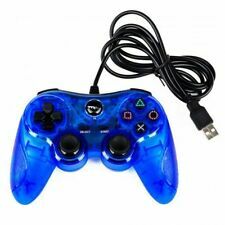 4.5 out of 5 stars - Sony PS3 SIXAXIS Wireless Controller PlayStation 3 "BRAND NEW"
17 product ratings17 product ratings - Sony PS3 SIXAXIS Wireless Controller PlayStation 3 "BRAND NEW"
Original Official Genuine Sony PS3 Wireless Dualshock 3 Controller Choose Color . Condition is New. Shipped with USPS First Class Package. Internal Product Sku: EE708756Type: SB00733. Item Type: PlayStation 3MPN: SB00733. Condition: Used: Like NewModel: SB00733. For PlayStation 3 And PC 6E. Location: #HH559Platform: Sony PlayStation 3. Left and right handed joystick. Raspberry Pi. Wireless Technology. New tested item fully working. PlayStation 3 Collector's Edition TRON PS3 Wired Controller Glows Blue In Box!